Mutuo, a not-for-profit society that supports the creation of new mutual organisations, has published a mutual business detector. The detector is designed to provide an initial indication of whether it will be possible to “spin out” a council service into a new mutual organisation. The council have been involved in the development of the detector, having piloted the approach with a number of council services. It isn’t intended to provide a definitive answer as to whether a service should spin out, but does provide an indication of where the service does have a fit with a mutual approach and where there are challenges that would need to be overcome. The detector is available on the Mutuo website and includes full instructions of what to do. Using the detector shouldn’t take any more than 15 minutes so it really is a quick and simple tool. Social Enterprise London (SEL) have published a new guide, Spin Out and Deliver, aimed at public sector workers who are considering setting up as a social enterprise. This short document contains useful information which has been drawn from interview SEL have conducted with people who are currently looking to “spin out” from council ownership to a social enterprise. The lack of infrastructure support available to emerging spin-out organisations. 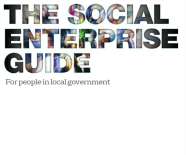 This guide also includes information about why establishing a social enterprise to run a public service can be a good idea; being an outstanding social enterprise leader; and steps to get started. You can download a copy of Spin Out and Deliver, or any other SEL publications, from the SEL website.